Introduce students to the importance of carbon and its cycling between the living and nonliving parts of the ecosystem and earth system. Model the movement of carbon through different reservoirs. Compare and contrast fast and slow processes (short and long residence times) that move carbon. Understand that the path taken by an atom through a biogeochemical cycle is complex, not a circle, and provide an example of conservation of matter. Put processes such as photosynthesis and respiration in the larger context of biogeochemical cycling. Students will take on the role of a carbon atom and record which reservoirs in the carbon cycle they visit. They will compare and contrast their trip with those of their classmates to discover information about sources and sinks, and residence times of the different reservoirs. Ocean processes are highlighted to allow the educator to define the biological pump and explain its importance to climate. Understanding the sources and sinks of atmospheric carbon dioxide is necessary to understanding the causes and consequences of climate change. 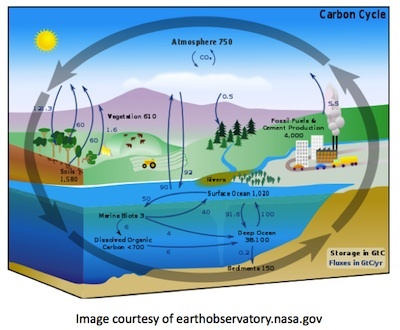 The carbon cycle is complex, with many reservoirs both living and nonliving, each with a number of sources and sinks. To put the carbon cycle in the context of understanding climate change and the issues scientists are concerned with, we focus on the sinks of atmospheric carbon dioxide, and the fate of the carbon after it is removed from the atmosphere. As people burn fossil fuels for energy, large amounts of carbon dioxide are released into the atmosphere. This introduces a large source of both carbon, and a greenhouse gas. Scientists interested in the long term effects and possible outcomes of this source of greenhouse gas are interested in sinks that not only remove carbon dioxide from the atmosphere, but provide a source of carbon to a reservoir with a long residence time. Understanding the connections between reservoirs, and the interaction between long and short residence times, is very helpful in understanding ongoing scientific research and its importance to concerns about climate change. It is helpful, but not necessary, to have more than one die for each station. B. 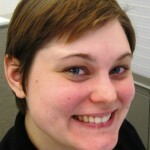 Cut out the dice and crease along the lines between the faces. C. Tape the open edges together to make a cube. It is helpful to weight the dice with a ball of scrap paper about the same size as the finished cube. Filled dice roll more easily than empty ones. D. Print out the Station Markers (color or black and white). 2. A station marker posted where students can easily see it once moving around the room. 3. A cup filled with the corresponding color of beads. F. Cut lengths of string or lanyard for each student and knot one end. A. Review with students why carbon is so important (to biology, and climate). B. Tell students they are going to pretend to be a carbon atom moving through the carbon cycle. Review the water cycle as a familiar concept, and introduce terms such as reservoir, source, and sink using the water cycle as an example. C. Go over what reservoirs will be included in the carbon cycle game. Note for students that there are many other reservoirs we are not including, such as fossil fuels. 1. Students will keep track of their journey by adding a bead to their string to represent each reservoir they visit. 2. Students should add a bead first, so they don’t forget, then roll the dice. 3. Students should read the dice carefully for information about the process that is moving them from one reservoir to another, and then go to their next station as instructed by the dice. 4. If a die tells them to stay in place for a turn, they should add another bead of that color before re-rolling. 5. As students represent carbon, an element, they don’t “want” to go to any particular place. There is no “goal” they are trying to get to and they should go where the dice take them. Each turn they should roll the appropriate die ONCE, and whatever it says is what they do. 6. Students should continue moving through the cycle until they have fifteen beads on their string. E. Give students their starting location. The carbon cycle is a large and complex topic, so how you distribute them is up to whatever connections you would like to make during the discussion portion. 1. If you would primarily like to discuss residence time, start a couple groups of students in the atmosphere and surface ocean, and a couple in the sediments and deep ocean dissolved reservoirs. This is where it is helpful to have duplicate dice for some stations – if you would like eight students to start in the atmosphere, you may want to make at least eight atmosphere dice. 2. For the biological pump, start all students in the atmosphere and surface ocean. Be sure you don’t let any students begin in deep ocean particles or ocean sediments. 3. Once students get the hang of it, the game goes quickly, so if you have enough materials you can certainly run the game more than once, with a slightly different focus each time. F. Monitor students as they move through the cycle and remind them of the rules if needed. G. When students have finished their cycle, pass out worksheets and have them decode their string of beads back to which reservoirs they represent. H. Have students compare their cycle to their neighbors’. I. Use the diagram to represent the journey through the cycle as a series of arrows. Is a cycle a circle? 1. Overall, which reservoirs did students visit the most? 2. Which reservoirs have long residence times? Which have short residence times? Use the seltzer or soda to discuss carbon dioxide moving between air and water. Initially many students will use the terms “evaporation” and “condensation” when you ask them how carbon moves from one to the other; remind them that those are terms for the water cycle and for changes in state of matter. The soda is helpful both to show that air and gas dissolves in water in the same way that solutes such as salt do, and to help them connect to the short residence time of gas in liquid (“If I open this and leave it here overnight, will it still be fizzy tomorrow?). 4. What processes move carbon from the atmosphere to the ocean sediments? Define the biological pump for students. The biological pump is the set of processes in the ocean that sequester carbon (make it unavailable to be recycled back into the atmosphere for a long period of time). Identify if any students were sequestered (Atmosphere – Surface Ocean – Ocean Plants – Deep Particles – Ocean Sediments. Can also stop at Ocean Consumers between plants and particles). Scientists are interested in areas of the ocean with a very efficient biological pump, as well as areas of the ocean where the biological pump is either less efficient than expected, or decreasing in efficiency. Higher level students can research iron fertilization experiments and make connections back to these concepts. 5. Have students brainstorm what reservoirs and processes have not been included in the game (soils, fossil fuels, sedimentary rocks; burning of fossil fuels, subduction of sediment and volcanic eruptions for a few examples). 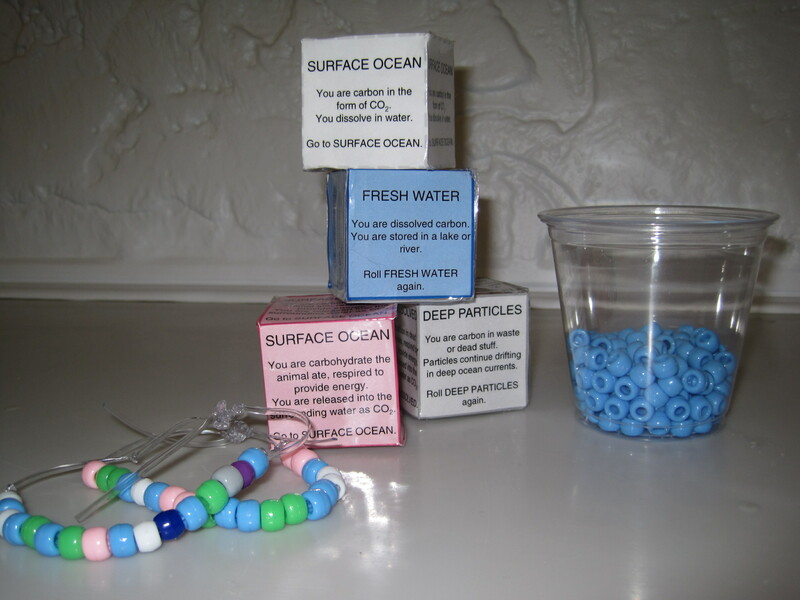 As an extension, have students make sample dice to try and represent the sources and sinks for these reservoirs, and their fluxes and residence times. This requires students to understand that a) each face of a die represents a sink from that reservoir, b) the larger the flux for a particular sink, the more faces of the die are assigned to it, and c) the longer the residence time the more “roll this station again” faces a die needs. For upper level students who are spending more time studying biogeochemical cycles, challenge students to adapt the game for another element, such as nitrogen. Students can decide which reservoirs to include and how to represent the sources, sinks, fluxes, and residence times by varying the dice. They can play their created game to see how well they represented the cycle. Optional: If you don’t have the materials to have the students use beads/make bracelets to record their journey, you may use a simple worksheet to have them keep track of their journey as they go. Helping students understand conservation of matter (in this case, carbon) in processes like photosynthesis and the carbon cycle as a whole is essential to their understanding of environmental issues surrounding clean energy and climate change. The inspiration for this game comes from Project WET’s activity “The Incredible Journey.” Find Project WET resources at: http://projectwet.org/.